FREE SHIPPING (First Class) to the United States! 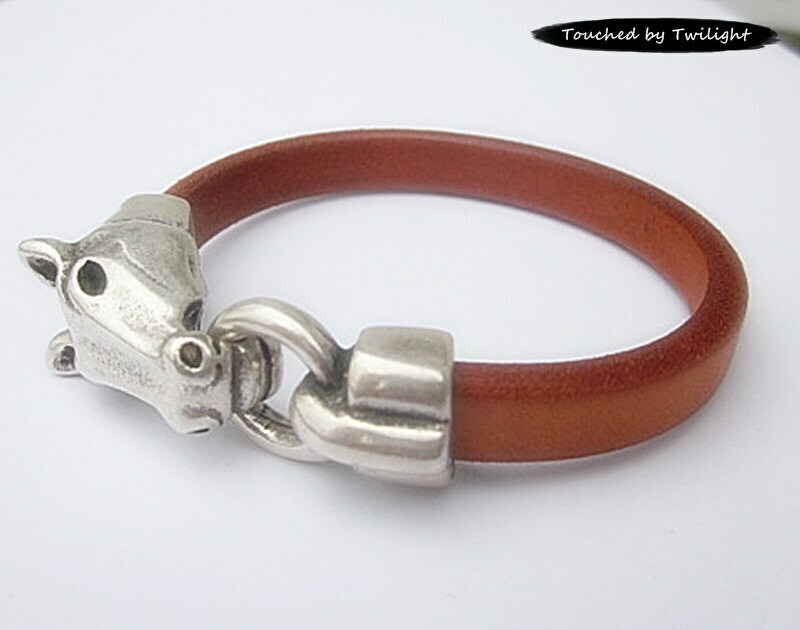 This simple, yet elegant, bracelet is handcrafted from genuine tan Regaliz leather with an antique silver horse head clasp. 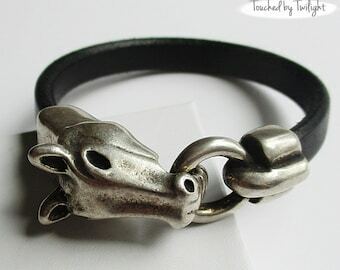 To wear: Simply unhook the ring from the horse's mouth and wrap around your wrist, and re-hook the ring. A word about my cord . . . It is genuine leather that has been dyed and cut. The dye is lead and chromium free, and complies with all EPA regulations. As with most dyed leather, the dye is not 100% colorfast. And, as with all genuine leather, after repeated use it will begin to show wear, especially around the area that may rest on (for example) a desk. This only adds to the charm of the piece. The size of this bracelet is the inside diameter measured when closed. The size you should order will depend on your wrist size (generally measured just above the wrist bone and add 1/4" for comfort) as well as your personal preference in fit. When measuring for this particular bracelet, keep in mind that the horse head clasp is fairly heavy and a SNUG FIT is required to both keep the horse head on top of your wrist as well as to keep the bracelet "latched". Please select your size carefully. While I will always accept a return (in the same condition as it was shipped to you) due to incorrect sizing, you will be responsible for the cost of returning it to me. Because I know that selecting a bracelet size without trying it on is a difficult task, as a courtesy, I will cover the cost of sending the new bracelet size to you (one time only). If you do not see the size you need or if it's sold out, please contact me and I'll make one for you . . . Your bracelet will be attractively packaged in a gauze drawstring bag and shipped in a sturdy shipping box. Don't forget to view my "policies" section for information on shipping, cancellations, etc. This is especially important for shipments to countries outside the US. If you have any questions, please do not hesitate to contact me. Love the design and look. Wear it everyday. Shipped on time. Easy shopping experience. 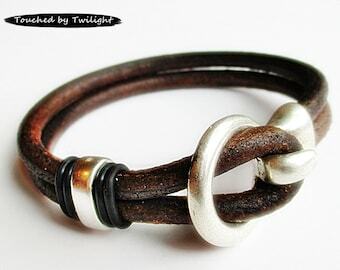 Really nice casual bracelet. I will be wearing this alot. Received quicky. Packaged nicely. Thanks! Love this bracelet! Takes a bit of getting used to the clasp while trying to remove, but practice makes perfect. Looks great. Perfect sizing. Can I return an item because I've changed my mind or ordered the wrong size? Yes, you can -- depending when you've purchased it. Please contact me prior to returning. 1. You pay all postage and insurance fees to return it to me. 2. There must be no wear or damage to the item. 3. After receipt of the return, I will issue a refund to you MINUS the original shipping fee charged (if any) and a "re-stocking fee" of $3. This fee covers costs that I must recoup (selling fees, packaging, labels, time, etc). What if I've accidentally provided an incorrect shipping address? If you've provided an incorrect address or the post office refuses to deliver to your address (ie: lack of access to mail receptacle, pet interference, access is blocked, etc) in most cases, USPS will return the package to me. I will contact you upon receipt of the returned shipment for the correct and accessible address and to arrange payment from you for the re-shipping cost. If your item purchase included "free shipping" you will still need to pay for the re-shipment as I met my obligation to ship "free" when I shipped your purchase the first time.